Create Professional Invoices Instantly•No Need to Learn Complex Accounting Software! •Customization Wizard Makes It Easy to Create Invoice Designs! •Fill Invoices Out Directly On Screen. 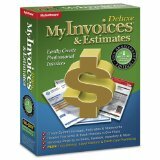 •Turn an Estimate Into an Invoice in Just One Click. •Email PDF Invoices for Faster Payment.